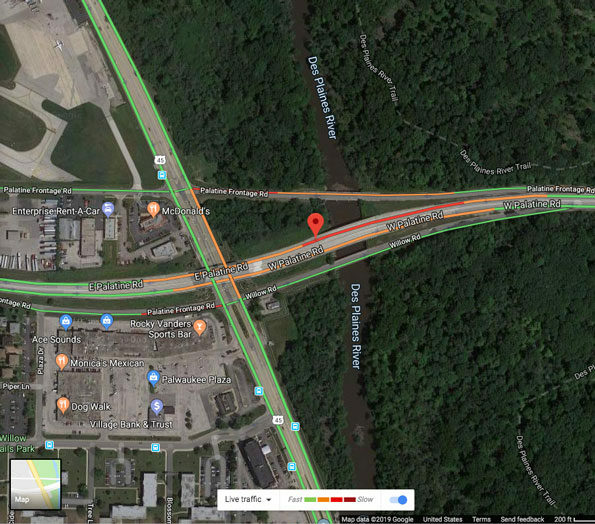 Prospect Heights police and firefighter/paramedics responded about 5:46 AM Monday April 15, 2019 to a report of a crash with injuries on the Palatine Road bridge at 42.108858, -87.888232 (Palatine Road and Milwaukee Avenue Prospect Heights, Il). Police and firefighter/paramedics received a report of a crash with injuries involving a car that hit the wall in the westbound lanes. The Palatine Road bridge was reported to be a sheet of ice over Milwaukee Avenue. Engine 39’s crew on arrival reported the bridge is covered in ice and that the crash is in westbound lanes with four cars involved and two patients with injuries. Palatine Road crash on bridge over Milwaukee Avenue Map.